The Space Shuttle Program (SSP) big guns have praised the “tremendous manner” in which the STS-131 mission was completed, as Discovery begins her final processing flow on the current schedule. STS-133 may still avoid becoming the final mission to fly – pending approval of a mission swap with the slipping STS-134, or the potential addition of STS-135. Discovery returned from the International Space Station (ISS) after delivering tons of cargo via the MPLM (Multi-Purpose Logistics Module) Leonardo and installing a new Ammonia Tank Assembly (ATA). The veteran orbiter also returned an array of down mass from the Station – including science experiments – along with an old ATA. Despite some minor challenges during two of the mission’s three EVAs (spacewalks), the mission was highly successful, earning the praise of shuttle management. “Mr (LeRoy) Cain (Chair of the Mission Management Team) thanked the team. STS-131 was a good mission and had outstanding support every day at the MMT and throughout the mission through the teams that support,” noted the latest Shuttle Standup/Integration report (L2). “It was a tremendous flight,” added SSP manager John Shannon. “The Operations and Engineering teams are working together very well. They worked around the loss of the Ku-Band antenna to figure out clever ways to get the required data down. The process is working so smoothly to assess the health of the vehicle. Discovery was given a preliminary inspection whilst sitting on the runway at the Shuttle Landing Facility (SLF), with reports showing nothing more than minor dings and cosmetic damage to her Thermal Protection System (TPS). One area of interest related to Discovery’s numerous ceramic inserts – one of the main Flight Readiness Review (FRR) and Special PRCB (Program Requirements Control Board) topics ahead of launch. While the Payload Bay Door hinge line inserts are currently being evaluated inside Discovery’s OPF-3 (Orbiter Processing Facility), the runway report notes a problem may still exist on the window inserts’ ‘plugs’ – one of the initial trigger for pre-flight checks, following an incident with a protrusion, which was observed during Endeavour’s STS-130 mission. After being towed off the SLF, integrated roll-in operations begin inside OPF-3, as Discovery was put through a preset list of safing procedures. “APU (Auxiliary Power Unit) plug installations are complete. Potable water sampling was completed,” noted the NASA Test Director processing report (L2). “Flight Crew Systems de-stow is complete less fire extinguisher removal and ET umbilical camera removal. Orbiter mid-body access doors were removed and Power Reactant Supply and Distribution (PRSD) scupper installations have been installed. “PRSD (Power Reactant Storage and Distributation) Pneumatic Operated Disconnects (PODs) mates and leak checks are complete. SSME (Space Shuttle Main Engine) bearing drying purges complete. PRSD LH2 off load complete. LO2 of load in work. “Orbital Maneuvering System (OMS) and aft `Reaction Control System (RCS) access panel removal and Quick Disconnect (QD) flight cap removed. OMS/RCS static air sample access panel removal scheduled for today. Air samples began Friday Main Propulsion System (MPS) and SSME Pressure regulator checkout and SSME pneumatic system validation tests are complete. Discovery’s Payload Bay Doors received their strongbacks – which aid the opening of the doors, as they can only open under their own power in micro G – on Friday, allowing engineers to opening the doors and begin operations to remove the old ATA and the MPLM – set to begin on Sunday. With numerous turnaround tasks being carried out over the weekend, Discovery is now processing towards what is currently scheduled to be her last flight. Engineers have also begun opening work on the Ku Band uplink/downlink failure that occurred during STS-131. 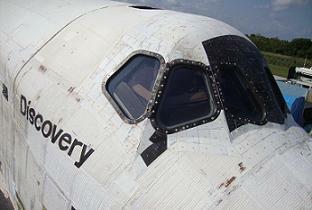 This on orbit issue has been charged as IPR (Interim Problem Report – 5) against the STS-133 flow. 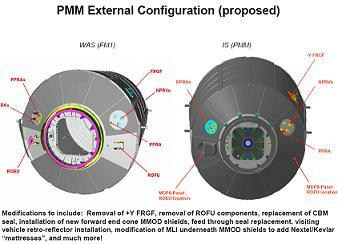 The payload for the STS-133 mission will be the ELC-4 (ExPRESS Logistics Carrier 4) and the Permanent Multi-purpose Module (PMM) – which sees Leonardo once again riding with Discovery, only this time remaining on the Station, as a modified storage area. Booster buildup for STS-133 continues to take place in the RPSF (Rotation Processing and Surge Facility), while Discovery’s External Tank is on track to arrive at KSC in a timely manner. Turnaround of the MPLM into the PMM remains the tightest element on the schedule to make the current STS-133 launch date of September 16. 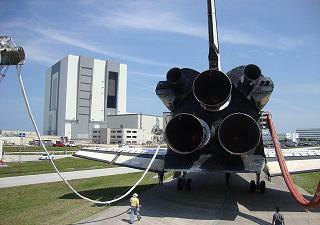 As such, should STS-134 swap places with STS-133 in the running order, Discovery would become the LON vehicle for STS-132. The gap between the two flights remains under discussion, and potentially could result in STS-132 slipping to the right to close the gap – based on the CSCS (Crew Shuttle Contingency Support) timeline of supporting the STS-132 crew on the ISS until the next shuttle arrives to pick them up. The manifest question is a result of the heavily delayed delivery of the AMS-02 (Alpha Magnetic Spectrometer-02) payload to the Kennedy Space Center (KSC), due to a changes to its troublesome cooling system – resulting in the launch slipping to at least November. Switching the running order between STS-134 and STS-133 is no easy task and remains under discussion, following a manifest meeting on Friday at the Johnson Space Center. A full article on the situation will be published later. 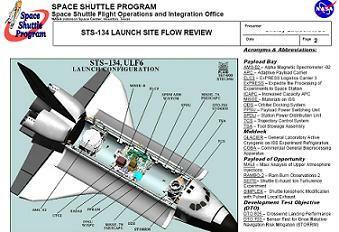 Even if STS-133 remains as the final flight on the current schedule, the addition of STS-135 – currently the Launch On Need (LON) shuttle for STS-133 – may yet receive approval. For the interim, the bulk of concentration is being placed on the next mission, STS-132. One of the major milestones will occur next week, when managers conduct the SSP FRR. Several articles will lead up to the two-day review.